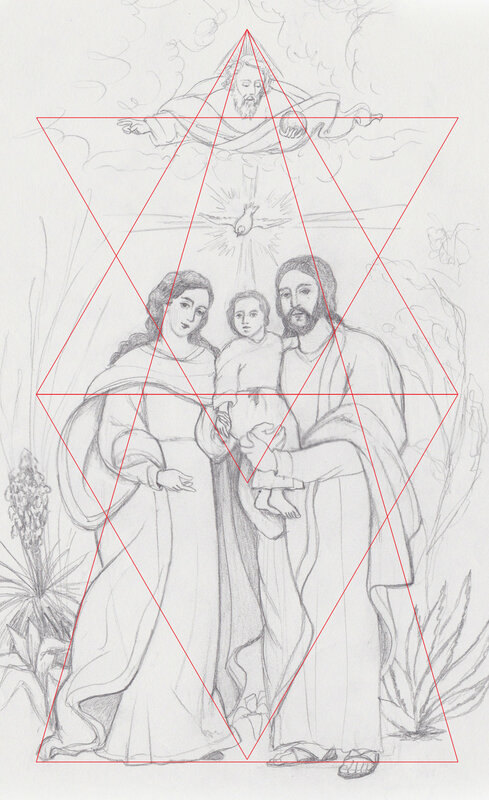 For the celebration of the 50th Anniversary of the founding of the Diocese of Phoenix, The Holy Family was commissioned to help express the theme of the year’s events, and a preliminary sketch accompanied Bishop Olmsted’s beautiful Apostolic Exhortation, “Complete My Joy- To Husbands and Wives, Mothers and Fathers of the Diocese of Phoenix,” 2019. (Watch Bishop Olmsted’s introduction- https://dphx.org/complete-my-joy/ and read Complete My Joy- https://family.dphx.org/). 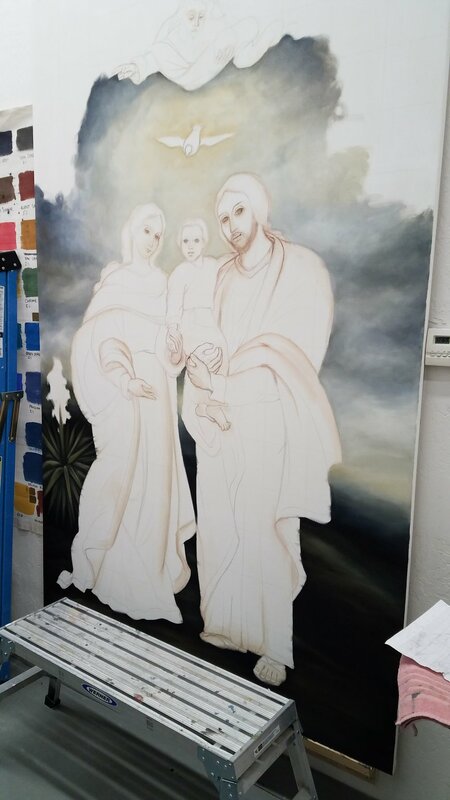 Inspired by traditional Spanish depictions of the Holy Family and evocative of the Diocese of Phoenix’s mission heritage, this piece features elements of the Cuzco School of Catholic sacred art and a depiction of the Holy Family as an image of the Holy Trinity. Father, Son, and Holy Spirit are depicted in close relation to the Holy Family- Joseph, Mary, and the Child Jesus. 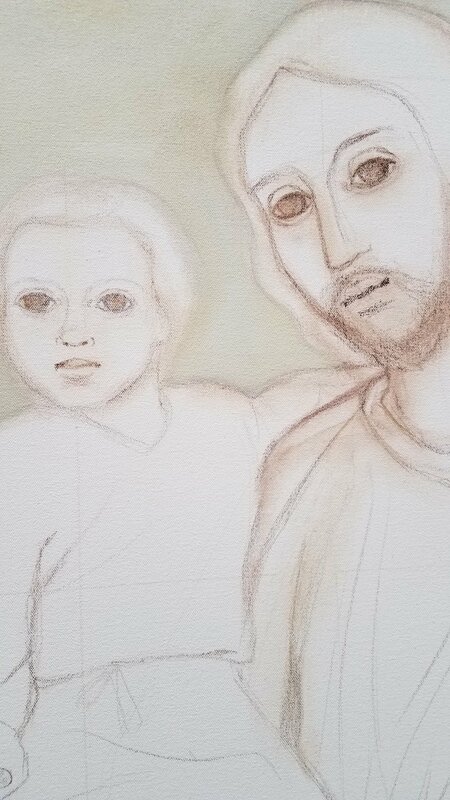 St. Joseph, beloved spouse of Mary and foster father to Jesus, has been given many titles by the church: Most Chaste Spouse, Defender of the Church, Terror of Demons, Mirror of Patience, Model of Artisans, and St. Joseph the Worker, among many others. Scripture offers us no spoken words of St. Joseph, but his silence teaches us volumes about his humble strength, fortitude, and reliance on God. Joseph's actions are where we see his true holiness of character. He lived as the head of a family with a wife and child who were sinless. He worked hard to provide for them, to protect them, following God's instruction along the way without wavering. St. Joseph is the model of a good father and a man devoted to Christ. This depiction of St. Joseph the Worker is intended to be a companion to the Miraculous Image, Our Lady of Guadalupe. Although this divine image needs no addition to make it complete, my thoughts were to create a family portrait. The Image of Our Lady is shown carrying the Christ Child in her womb, so I wanted to show what is often hidden, Joseph's particular attentiveness and gentleness, strength and protection as the head of the Holy Family. The work is painted in oil, in a similar style as the Image of Our Lady, and can be hung on either side as a companion piece. Our Lady of Guadalupe is rich with symbolism, meant to teach a degraded culture about the mercy and love of God. In this way, I incorporated many symbols in my image of Joesph to tell the particular story of how God's grace was manifested in his life and actions. St. Joseph is shown in a glorified state, surrounded by heavenly clouds and rays, yet his feet are grounded on the Rock, the Church, which can also be seen as a mountaintop, a symbol for advancing in holiness. He has lily flowers at his feet, evoking the gentle humble path of purity in which he walks. In his left hand, the staff symbolizes stability, steadfastness, protection and guidance. 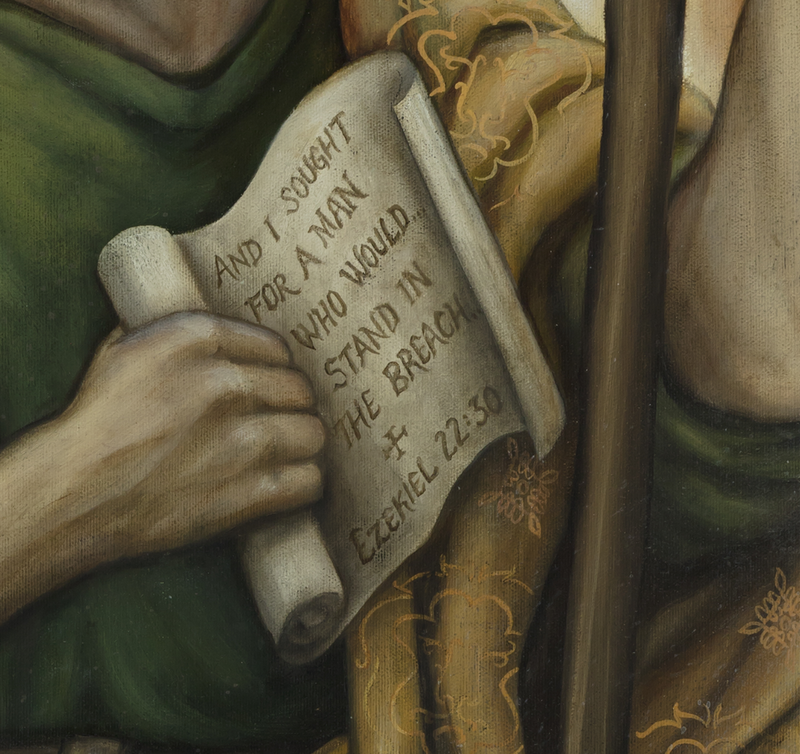 He holds a scroll of the scriptures in his right hand with a passage from Ezekiel, telling of his role as spiritual leader. In his belt there is a hammer, representing strength and provision for his family. St. Joseph also comes from a royal lineage, the House of David of the Tribe of Judah. The traditional color for the Tribe of Judah is brown, and the symbol is the Lion of Judah. These you will find on his outer cloak in a stylized pattern similar to that found on the robe of Our Lady of Guadalupe. The stone representing the Tribe of Judah is the emerald, the color of Joseph's tunic. Xavier College Prep, in it's ongoing mission to nurture the faith-lives of its students, wanted to celebrate the Four Women Doctors of the Church in a visual way that would become woven into the fabric of the school's faith culture. They asked for the four saints to be painted as icons that could be placed in each classroom, accompanying the students through each level of their high-school career and acting as class patron. Freshmen were given to St. Therese of Lisieux, sophomores to St. Catherine of Siena, Juniors to St. Teresa of Avila, and Seniors to the recently-canonized, St. Hildegard of Bingen. The original paintings are 5 by 1.5 feet, and hang at the entrance to the school, and they are often displayed in the school masses. Ruth chose to paint the women saints borrowing heavily from the iconographic tradition, in order to help introduce students to the most sacred and ancient form of Catholic liturgical art. Their forms are stylized and still, graceful, yet strong, suggesting rootedness in the firm foundation of the Church. Yet, their faces are subtly naturalistic and softer, appealing to young people who are learning to look at traditional sacred art for the first time. They are relatable, yet they challenge the viewer and call them into the heavenly realm. Each painting is surrounded by a field of pure gold leaf, evoking the uncreated, glorious light of heaven. Each saint holds an emblem of their lives or martyrdom. The Occursus Domini chapel was conceived by the University's president, Msgr. James Shea, and largely funded by the generous patronage of the of the Vetter family of Bismarck, North Dakota. The chapel resides in the newly built St. Scholastica residents hall for women, the third floor of which is home to juniors and seniors who are engaged in serious vocational discernment. Msgr. Shea envisioned a chapel of Eucharistic encounter where the young women could come and pray with Christ in an intimate and sacramentally beautiful chapel, even in the midst of a bustling university dorm. Designed by architect Adam Hermanson of Integration Design Group, Arvada, Colorado, the design of the chapel invites the worshiper progressively, to more intimate encounter with Christ, ultimately in the Eucharist, which is reserved in a beautifully crafted tabernacle surrounded by luminous alabaster panels. The four works of art by Ruth Stricklin are painted on solid wood icon boards constructed by Fr. Dimitri Kulp of St. John's Workshop, Blue River, Wisconsin, and incorporate gold leaf borders, enhancing the sense of sacramental beauty and encounter with the living Christ.